Learn the Ankle Replacement-BOX total ankle replacement (MatOrtho) surgical technique with step by step instructions on OrthOracle. Our e-learning platform contains high resolution images and a certified CME of the Ankle Replacement-BOX total ankle replacement (MatOrtho) surgical procedure. Ankle replacement has been available as an intervention for ankle arthritis since the 1970s. The initial implants were engineered on the assumption that the human ankle joint functioned as a true hinge . They were therefore designed only to allow uniplanar movement (plantar and dorsiflexion) and comprised just 2 components which were mechanically linked. The ankle joints they were implanted into however also functioned with a degree of rotation which had to occur at the weakest point in the “mechanism”. Given the robustness of the implanted ankle hinges this transpired to be the implant/joint interface which therefore led invariably to early implant failure. 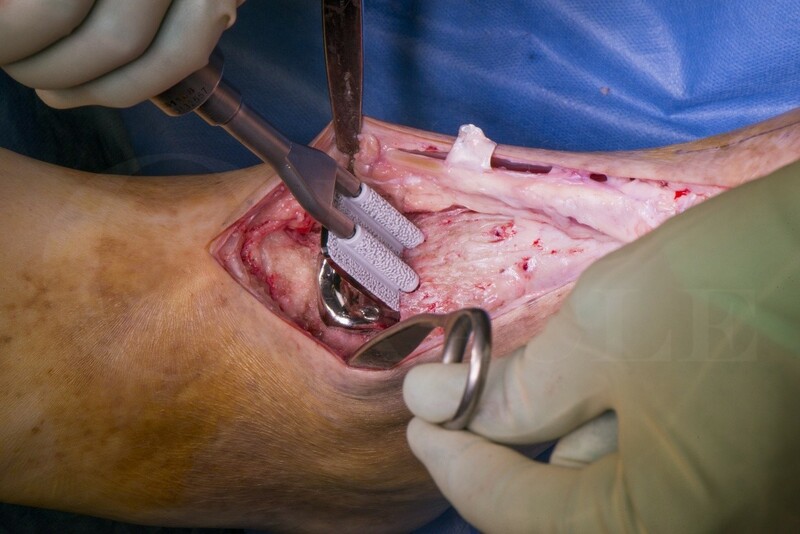 The next generation of ankle replacements used a 3 component design, in which the Tibial and Talar components were linked by a UHMW polyethylene meniscus which allowed rotation to occur within the joint itself. These ‘mobile-bearing’ prostheses used the congruity of the ‘articulating’ surfaces, to reduce the constrained forces and overcome the high contact stresses resulting in a reduction in polyethylene wear and mechanical loosening of the fixed components. These initial replacements whose results still define what longevity an ankle replacement should attain are the STAR , Beuchal-Pappas and Salto implants. Advancements have been made in the instrumentation and reproducibility of implantation. In general their 10 year survivorships are lower than reported for hip and knee replacements UK National Joint Registry survival rates are now in the region of 80 percent. Total ankle replacement is generally not be recommended for younger or higher demand patients due to concerns of longevity due to accelerated wear of the implant, the exception being patients with severe poly-articular inflammatory arthropathy. The BOX (Bologna-Oxford) ankle manufactured by MatOrth is a three component prosthesis. The Box ankle replacement prosthesis has been designed to maximise congruency throughout the arc of motion, aiming to mimic normal ankle biomechanics. The bearing surface of the tibial component has a subtle curve in the coronal plane to accommodate for varus/ valgus force through the talo-crural joint. Biomechanical modelling has demonstrated both rolling and sliding motions take place at the talocrural joint. In theory, full congruence should reduce wear by avoiding edge-loading. Similar to the STAR prosthesis, two anchorage bars on the tibial platform of the BOX ankle replacement provide stable primary fixation to the tibial bone. A precisely cut talar component allows a good press fit of the talar component, which is further stabilised with two vertical pegs. Primary stability of the Box ankle replacement components reduces micromotion assisting the circumstances necessary to provide reliable bone ingrowth.